Anthony O’ Toole is a Private Chef, Food Writer, Cookbook Collector and founder of Culinarian Press, a consultancy company that mentors and collaborates with food enterprises in Ireland and the UK. In 2016, Anthony was appointed a Failte Ireland Food Champion. His extensive list of qualifications in the industry and his involvement in the Theatre of Food in Electric Picnic, Slow Food Ireland and Irish Guild of Sommeliers make him the ultimate Rockin’ Food expert. Liz Hore, Enniscorthy Municipal District Manager, plays a key role in the Rockin’ Food Festival as a Wexford County Council Representative. The local authority provides the festival with key funding and incites economic activity in the town and surrounding areas. Enniscorthy Municipal District assists with management and promotion of the festival partnering with collaborative stakeholders in showcasing Enniscorthy. Both Richie Cotter and Eamon Doyle are well respected Rock ‘n’ Roll enthusiasts who are leading members of Catty Town Rock ‘n’ Roll Group. Richie and Eamon co-ordinate the Rock ‘n’ Roll Music, Dancing and Gigi Trail across the town throughout the festival weekend and also all year round. The history of Enniscorthy and the 1798 Rebellion are essential elements of the festival. 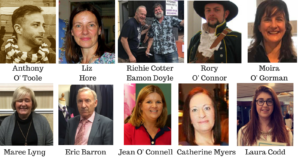 Rory, Moira and the Castle staff bring knowledge and expertise of the town’s history and create and organise events based on such heritage such as the 1798 Rebellion Battle Re-enactment. In 2017, Maree Lyng was appointed president of the Enniscorthy District Chamber. Holding two executive positions, Maree has second to none management and organisation skills which are crucial to the efficient preparation and running of the festival. Jean O’ Connell is a self-motivated, results driven director of O’Connell Marketing Ltd. Jean has years of experience in developing, creating and growing successful brands and the Enniscorthy Rockin’ Food Festival is a perfect example. Her focus, energy and genuine passion grants Jean a key role in the organisation, promotion and marketing of the event. Catherine Myers is the Marketing Assistant at O’Connell Marketing Ltd. Catherine is a dedicated, focussed and vibrant employee who excels in communication and organisation. She plays a significant role in the preparations of the festival and she is at the forefront of the administration element both behind the scenes and on the day. Laura Codd is the Digital Marketing Coordinator at O’Connell Marketing. Laura is an innovative, creative thinker in the area of content writing and design of the festival’s marketing material. With huge interest in Digital Marketing, Laura facilitates the promotion of the festival through Social Media and other forms of online marketing.